This post was originally created by me for Darice. Do you do Halloween decorations in your house? If so, do you go scary, gory, cutesy – what’s the look you like? 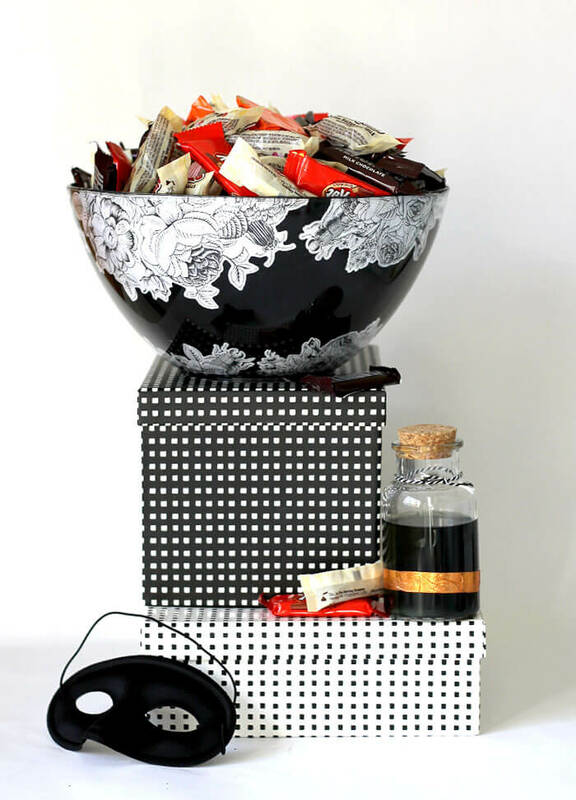 Sometimes I really like pretty Halloween – black and white florals, jeweled skulls – that kind of thing. 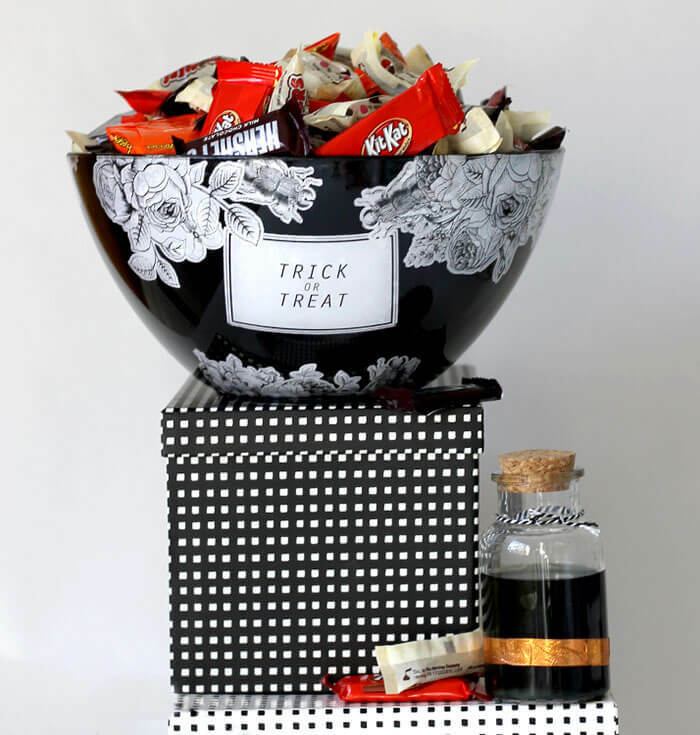 That’s the look I went for with this DIY trick or treat bowl. 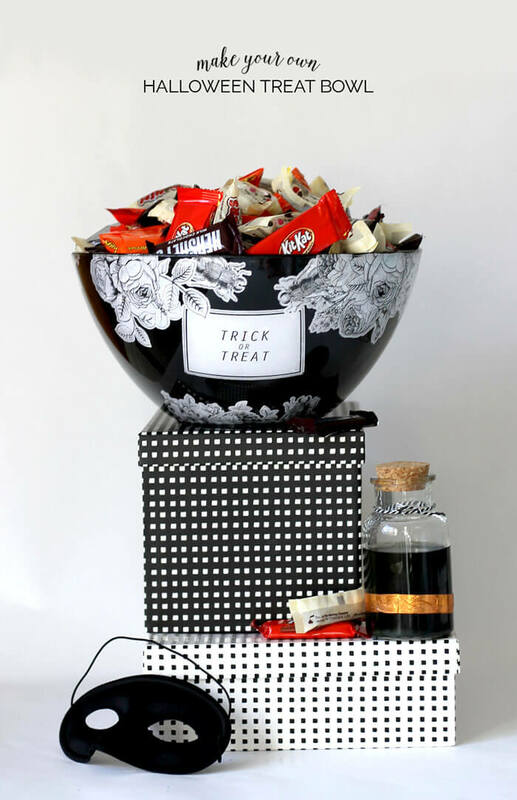 The finished Halloween DIY bowl is a little spooky, but mostly pretty and sophisticated, and I am really happy with the way this project came out. I love that it’s so glossy – I think it gives it a nice professional look. The trick to getting that polished finish is applying the printed elements and paint to the interior of the bowl and letting them shine through the plastic. It’s kind of a lot of fun. Want to give it a try? Here’s everything you will need. I started by adhering the flowers and insects around the top and bottom of the bowl. 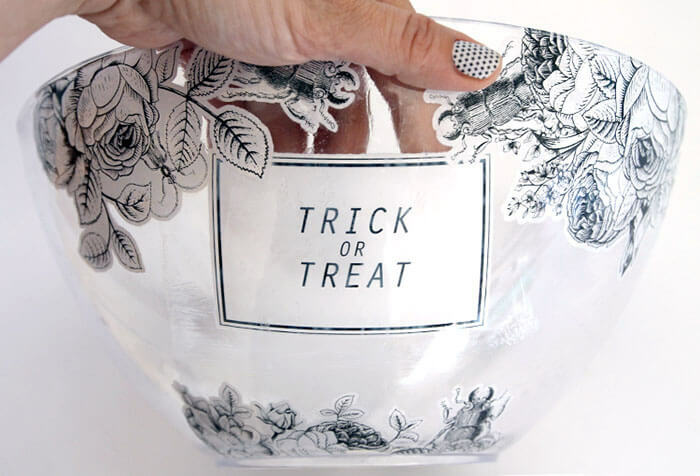 To do this, apply a thin layer of gloss decoupage to the top of the printed design AND on the bowl where the image will be placed. 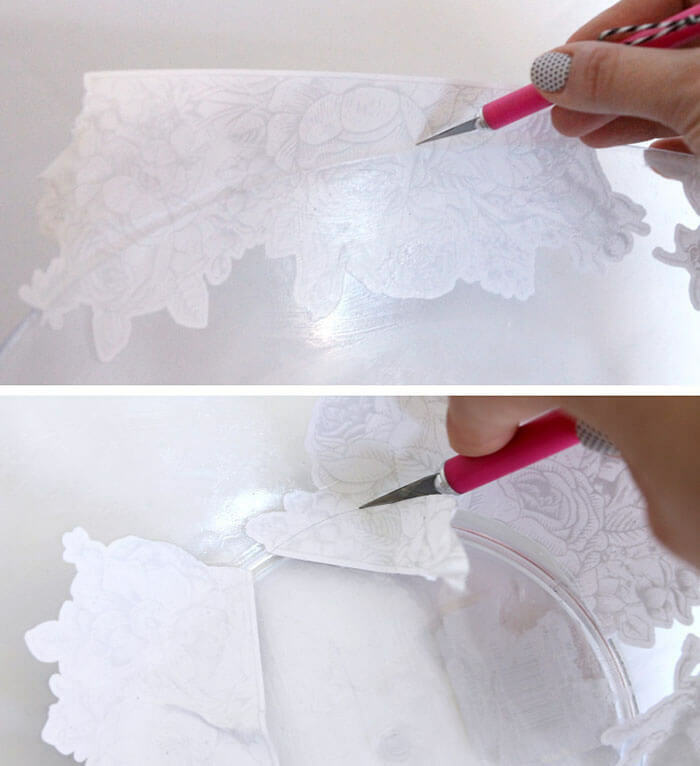 Smooth the paper onto the bowl with your fingers making sure there are no air bubbles or wrinkles. Finally, add another thin layer of decoupage over the top of the paper to seal it. 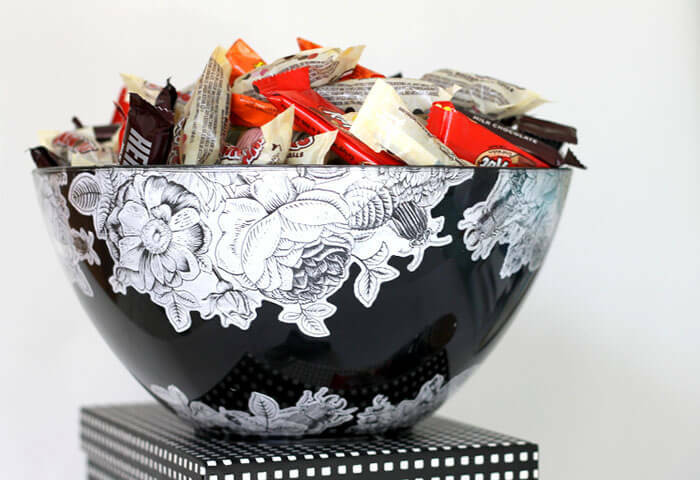 Wipe any excess decoupage off the rest of the bowl with a damp cloth. Continue adding the floral and insect designs around the top and bottom. There isn’t just one way to do this – just place the elements wherever they look good to you. 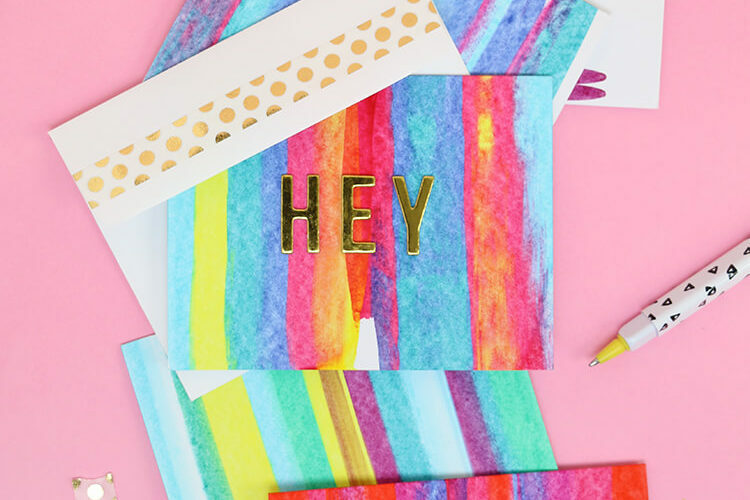 I love crafts where you can make it your own! 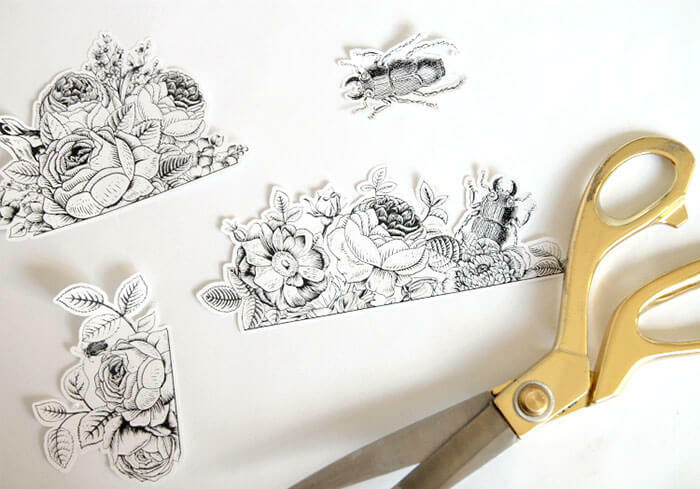 Trim off the excess paper from the top and bottom of the bowl using a craft knife. 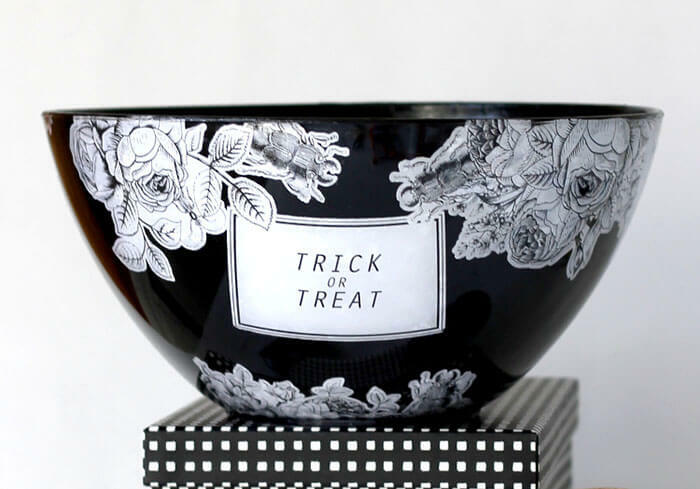 Finally apply the text printable to the bowl with decoupage. I liked the way it looked layered behind some of the floral pieces. Using craft paint and a sponge brush, paint the interior of the bowl. I went with black paint, but I think a pale orange would be really pretty too. It will take at least two coats of paint to get full coverage. After both coats of paint have dried, apply a thin coat of gloss decoupage to seal the paint. If you make your own bowl, I would love to see it! Share it to my facebook page or tag me on instagram. 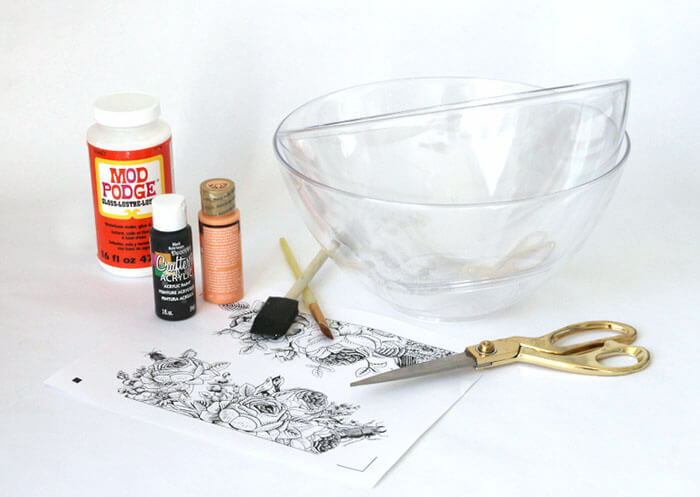 I had no idea that was a clear bowl – I thought you used ModPodge on top. Brilliant! I’ll have to make one for myself this year! This is seriously adorable, clever idea!!! Love it! WOW,, I had to do a double take because it looks like you purchased the bowl that way. It looks so professional and pretty. Way more festive than a plain clear bowl!